Here at web design Surrey’s Thunderbolt Digital team, our hard-working web developers and graphic designers sometimes find their minds wandering and eyes gazing out of the window, looking at the blissful surroundings of Farnham, Surrey. This often has our team pondering about which potential holiday destinations they might want to visit during 2014. Unfortunately for most of us in the digital agency industry, we are bound to our desks, but why don’t you let us live vicariously through you, and go out and enjoy yourself, sending us a postcard whilst you do so? Our web design Surrey team have come up with a few ideas, tips and tricks regarding lesser known holiday destinations you may like to consider when planning a trip abroad. 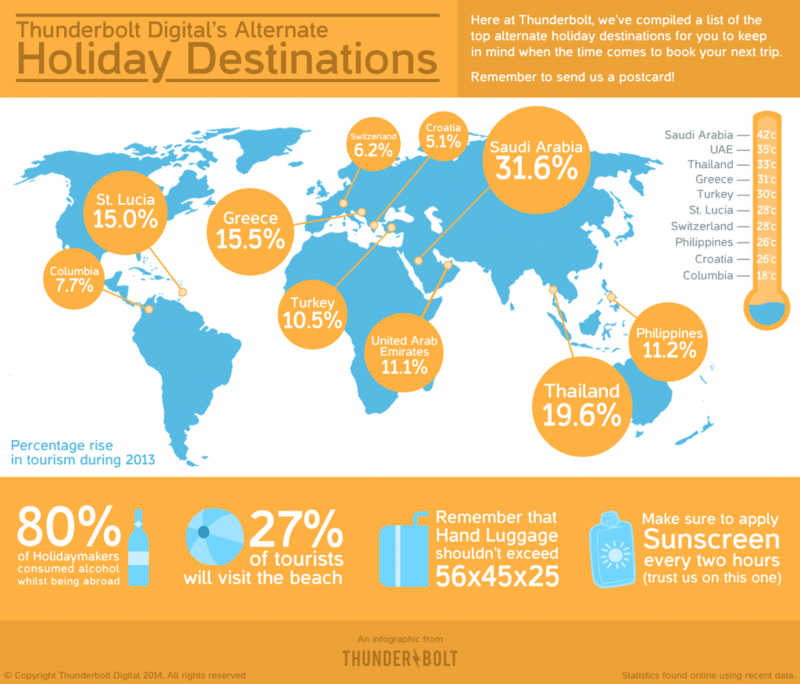 If you haven’t already thought about a well-deserved trip away this year, then our “Alternative Holiday Destinations” infographic might give you a wave of inspiration!